The following is a reflection written by Christine Cordero, one of the participants in the #Asians4BlackLives solidarity action on Monday, December 15, 2014. Christine is a Filipina-American born and raised in the Bay Area, CA. She is an organizer, trainer, and public speaker with over 15 years of experience working and organizing for social justice. On Monday morning, a multi-racial group of us shut down the headquarters of the Oakland Police Department for four hours and twenty eight minutes in response to a call from national and local Black leadership to end the war on black people. White, Asian, and Latino allies chained ourselves to the doors and blocked the intersections while Black organizers read out the names of those killed by police, led songs, and chants at the center. We remained there for four hours – the amount of time that unarmed Black teenager Michael Brown laid in the street after being shot by white police officer Darren Wilson, and 28 minutes – because every 28 hours a black person is killed by police, security, or vigilantes. The action was fast-paced and high-risk in planning and execution, leaving very little room to reflect. In the aftermath, we hope to improve and transform ourselves and our work in solidarity with each other through reflection and collective accountability. I offer these lessons as a continuation of our collective reflection as we challenge ourselves and others around the country to step up to the call to end the war on Black people. “In the US and around the world, everything is used as a weapon of war against black folks. It’s where we put polluting facilities. It’s who gets liquor stores instead of grocery stores, or even land to grow and control food. It’s who gets substandard housing. Who gets predatory mortgages. Who gets evicted. It’s about who gets crappy voting machines and who gets voter suppression. And it’s about who gets shot with the guns that we pay for. In this moment, the most important thing is to follow black leadership. That’s a good place to start, and it’s also complicated. Black organizers in the Bay and in other parts of the country are not a monolith. We need to create space, flexibility, and patience so they can work out their own leadership structures and accountability. They need time to have a process that’s right for their communities, just like we need time to have a process that’s right for ours. Our group, #Asians4BlackLives came together just one week before the action. I knew some people well, but others I didn’t know much at all. We reached out to the people we trust and respect, and those folks did the same. We trusted each others’ judgment, so I knew that everyone was there for the right reasons and committed to throwing down as Asians in solidarity with Black folks. Everyone played vital roles in making our part of the action happen successfully, whether it was those of us more visibly chained to the doors, to the people talking to media and live-tweeting, to the people standing by to organize jail support. Whatever the role, people supported each other with grace and love. That focus, openness, and commitment showed itself in the action. Once we were all locked in and had blocked the surrounding intersections, the black organizers arrived. I remember feeling like, “Wow. This is actually going to happen.” It was a really powerful moment because solidarity was made visible in who we are, what we were doing, and who was at the center. I’ve been doing work around social justice issues for many years. I have seen groups form and implode as people protested for Oscar Grant and then Trayvon Martin. I saw the ways in which our legal system fails to hold the men who killed them accountable. This October, I was able to go to Ferguson for the Weekend of Resistance. In Ferguson, young people had been showing up at the police station to protest every night since Michael Brown was killed. The first night we were there they chanted, “They think it’s a game. They think it’s a joke.” It was both a calling out of the police who don’t take their lives seriously, but also rage, hope, and affirmation that their lives are not a game or a joke. People were still grieving. 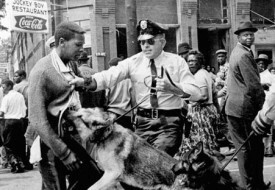 People were angry, but they were also really deeply taking care of each other and committed to justice. I saw that and felt these young people were building something beautiful. The other thing that stayed with me from that weekend in Ferguson was that many people who were out at the protests didn’t consider themselves activists or organizers. They became activists and organizers by being out in the streets. Some of the protests went until 2am or 4am, and they were learning how to do action planning in the moment. They were learning how to do blockades as they did them. I learned that while it can be messy, the most important thing is that we are militant and strong and caring in the ways that we show up for each other. When we heard the news that grand juries failed to indict police officer Darren Wilson for shooting and killing unarmed black teenager Michael Brown, a call went out from Ferguson to shut down business as usual to call for an end to the war on black people. Within weeks, another grand jury in New York failed to indict police officer Daniel Pantaleo for choking Eric Garner to death. I was both heartbroken and unsurprised by the continued violence and injustice of the U.S. “justice” system. A number of us really wanted to respond to that call and show up as a group of Asians to say that we stand in solidarity with Black communities, that we will not be invisible, safe, or silent. That we would use whatever means and privilege we have to stand up for Black liberation and hence our collective liberation. In the US, the racial hierarchy is mapped with white people at one end and black people at the other, with the rest of us people of color between. How we are positioned within greatly determines our experiences. When I was growing up, I got the message that “those Asians can be smart and they don’t rock the boat. Why can’t those other black or brown folks be like them?” Historically, we’ve been used as a wedge, to divide people of color, especially working class people of color, who otherwise have a lot in common. We saw this in Ferguson where a lot of the stores along Florissant Avenue where the protests have been happening, are owned by South Asians. When Rodney King was beaten by police officers and the LA Uprising occurred, a lot of the stores there were owned by Korean folks. And in both cases, we were used to justify the ways in which police came down on people. As a Filipino American, there’s something really sad and infuriating about the Spanish and US colonization of the Philippines and the impact it has had on our own beliefs about ourselves. There is still so much internal self-hate and colorism within Filipino culture. Indigenous Black Filipinos in the Philippines have their land taken away and their people decimated – just like indigenous people everywhere. There’s a lot of desire to be closer to white – straighter noses, lighter skin. I remember being told, “Don’t go out in the sun, you’ll get too dark.” That internal hatred makes me feel both angry and deeply sad. Then, there are these beautiful things that have happened. During the Philippine-American War, when the U.S. supposedly “freed” the Philippines from Spain and then had a war with a Filipino rebellion, the soldiers who left the U.S. lines and joined the Filipino insurrection were Black soldiers as they saw the connection between the way the U.S. treated Black folks in America and Filipinos in the Philippines. We don’t forget that stuff. That history is embedded in me. 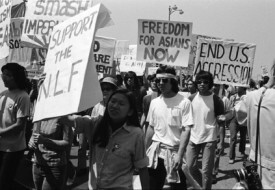 Many of our Asian American and Pacific Islander brothers and sisters around the country have written powerful statements in support of ending the war on black people. We hope that our communities will continue to practice an intentional Black-Asian solidarity by stepping up in whatever way pushes their comfort zones. In some communities that looks like challenging our own family members and friends on their own anti-black racism. For others, it means getting out to a protest for the first time, or organizing an #Asians4BlackLives march to visibilize that this is an issue for Asians. It can also mean making art, organizing direct actions, or political education at your place of work.The possibilities for creative action are limited only by our imaginations. There’s been a history of Black-Asian solidarity in the Black Power movements of the 70s. There are people like Yuri Kochiyama and Grace Lee Boggs who devoted their lives to building Black Power and collective liberation of our peoples. I hope that together, we build on that legacy by investing in each others’ communities and building relationships for the long haul. Hoping Christine’s excellent piece gets out there more! Gratitude for the work of Race Files.